Description - Our Diamond Plate Gym Floor Covers feature a unique raised pattern that will help to reduce slips and falls by 2 times compared to our standard Gym Floor Covers. Available in two neutral colors in two different weights, these floor covers will not only protect your gymnasium floor, but will also provide added safety to anyone on the floor. With the use of storage racks, these covers are very easy to install and store and are great for any large event such as graduations, banquets, and much more. Material – Ultra-durable, 3 ply fabrics with a PVC coated polyester mesh on both sides of the floor cover. Width – 10' wide rolls. Weight – Available in 27oz. and 32oz. rolls. Recommended Uses – Diamond Plate Gym Floor Covers have been used in multi-purpose gymnasiums for graduations, proms, banquets, concerts, special events, fundraisers, in high schools, grade schools, colleges, public arenas, and anywhere a protective floor cover is desired. 2 times more slip resistant than our standard Gym Floor Covers. 15-17 year warranty depending on weight purchased. For small orders please contact us at 800-613-0996. Can this cover go over commercial carpet? 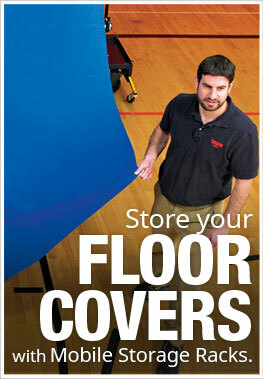 You can install our Diamond Plate Gym Floor Covers over commercial carpet.